Tokyo: Sony Corp said it is headed for its fourth straight annual net loss, instead of a profit it forecast earlier, as Thai floods disrupted camera production, adding to losses from a soaring yen and price slides in its TVs and PCs in the United States and Europe. The maker of Bravia TVs, Vaio computers and PlayStation game consoles changed its forecast to a loss of ¥90 billion ($1.1 billion) from a net profit of ¥60 billion earlier. The list includes Honda Motor Co , Panasonic , Nintendo Co Ltd and Nomura Holdings . Sony blamed the deluge in Thailand for cutting ¥25 billion in expected earnings, and reduced its TV sales forecast by 9% to 20 million sets , the second cut this financial year. “The Thai floods are only the latest problem for Sony, which is struggling to come up with another hit product like the Walkman," said Fujio Ando, senior managing director at Chibagin Asset Management. “As far as its TV business, its situation is the same as Panasonic’s — making deep cuts to stay competitive with no guarantee the restructuring will work," he said. Sony, which is heading for its eighth straight annual loss in its TV division, is revamping the unit, but a lack of details since the plan was announced three months ago and poor sales are keeping investors downbeat. “The TV business is an essential part of Sony’s growth strategy. We, as management, feel a great sense of crisis after seven straight years of losses," Sony Executive Deputy President Kazuo Hirai told a briefing. Sony, which also cut its full-year operating-profit outlook by 90% to its lowest level in three years, said earlier this week that it would split its television business into three divisions of outsourcing, LCD TVs and next-generation TVs from Nov. 1 to turn around the loss-making operation. Sony is also considering dissolving its flat-screen venture with Samsung Electronics Co , which will enable it to cut panel supply costs and improve its TV business earnings, according to sources familiar with the matter. It has yet, however, to unveil any plan. Sony’s revised net forecast compares with market expectations of a 49.5 billion yen profit in a Thomson Reuters poll of 18 analysts. “While Sony laid out external factors such as foreign exchange rates, macro-economics and the floods in Thailand as reasons (for its poor results), the firm has way too little resilience," said Shigeo Sugawara, senior investment manager at Sompo Japan Nipponkoa Asset Management. “I see that as the company’s fundamental problem," he said. Once a symbol of Japan’s high-tech might, Sony is struggling to come up with hit devices and finds itself outmanoeuvred in TVs by Samsung Electronics and in the booming smartphone market by Apple . “For Sony to come back it needs to focus more on its next generation image technology to convince people that it still has innovation in its DNA," said Yoshihisa Toyosaki, head of Japanese research firm and consultancy Architect Grand Design and a former Sony employee. 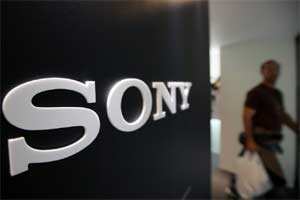 Sony posted an operating loss of ¥1.6 billion for July-September. Shares of Sony tumbled 3.6% to ¥1,520 ahead of the results on Wednesday. They have fallen 46% between the beginning of the year and Tuesday’s close, compared with a 14 pct fall in the broader market .